Published: December 31, 2018 • Modified: April 18, 2019 • by Author: Analida • Word count:687 words. • About 4 minutes to read this article. Sofrito is the base for most Latin American and Caribbean meals. It is used in stews, rice dishes, bean dishes and soups. Sofrito is not a single ingredient, but a tomato base concentrate, accented with garlic, onions, cumin, and jalapenos among other things. 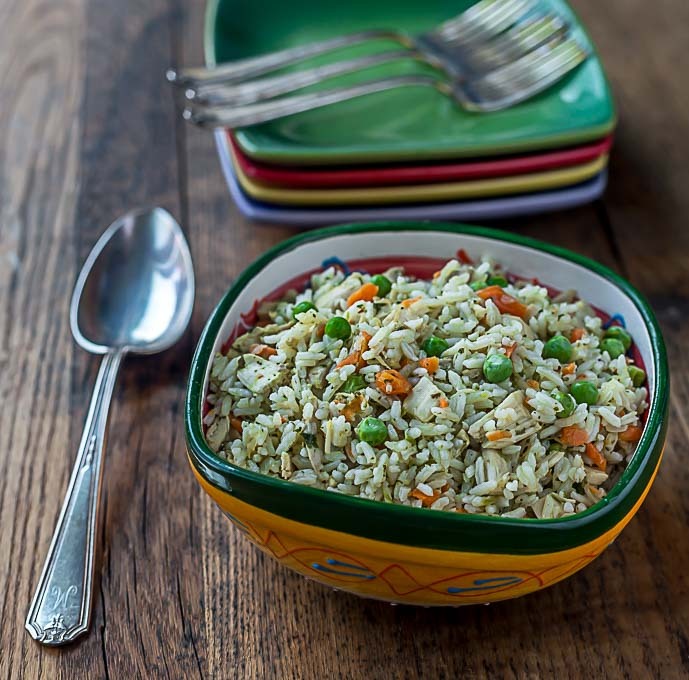 An arroz con pollo (rice with chicken), or carne guisada (stewed meat) would not be the same without the fabulous flavors sofrito imparts upon these dishes. In Spanish, the word frito means fried. Loosely translated then sofrito can mean soft fried, which is kind of what we do to the ingredients when we prepare sofrito. You can certainly buy sofrito in the grocery store, but why do so when it is so easy to make and costs pennies, literally per serving. 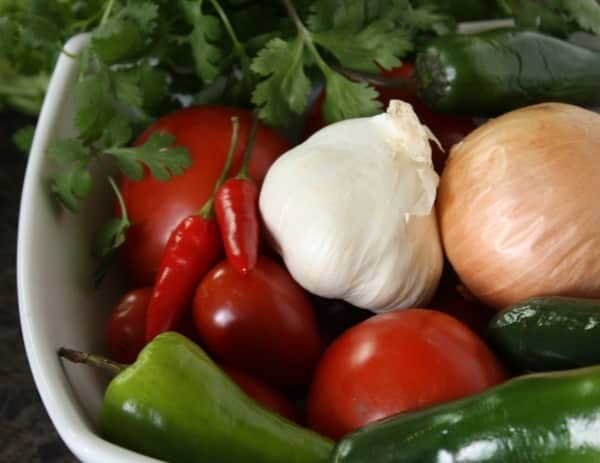 As an added bonus, the sofrito you make at home is 100% natural, No preservatives. Believe me; you will never purchase the prepackaged stuff again, once you start making your own. 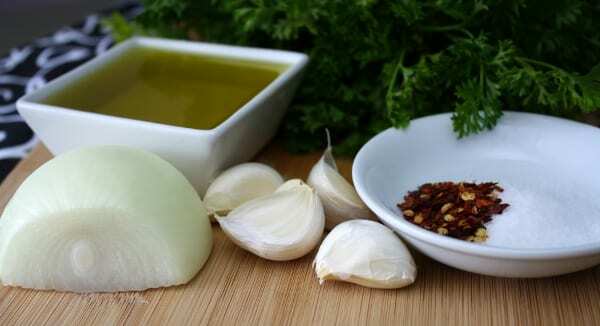 So, without any further delay, go to the recipe I have provided here for you and start making your own sofrito. Your stews will thank you!!! Muchas gracias! 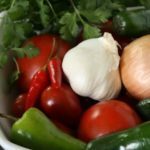 Since the home made sofrito does not contain any preservatives, it will not last more than three or four days in your refrigerator. which can be found at most housewares stores. If you do not have one of these, you can use a regular ice cube tray and once they are frozen, remove them from the tray and put them in a container with a lid or in a ziploc bag. These will last several months in the freezer and you can add a cube or two to your next Latin dish. 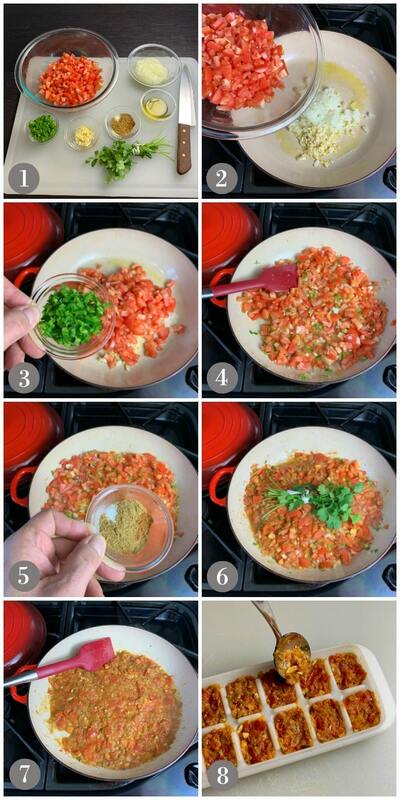 Here are the visual steps to make your own sofrito at home. Step 1: Gather your ingredients: tomato, jalapeño, garlic, onion, cumin, paprika, cinnamon, salt, olive oil and cilantro. Step 2: Heat the oil slightly and add the onions, garlic and tomato. Step 3: Add the jalapeño. Step 5: Add the spice mixture. Step 6: Add the cilantro tied with butcher’s twine. Cover and cook on low for 20-30 minutes. Step 7: Remove the cilantro and cook uncovered until the mixture is thick. Step 8: Allow to cook and freeze into and ice cube tray for future use. You have to try some Latin style black beans and rice that use the flavors of sofrito and recaito. Pernil is a slow roasted pork shoulder from Puerto Rico and very close to pulled pork but with a very different flavor profile from a BBQ pork. You will love this and want to keep it on hand in your freezer for an easy meal. 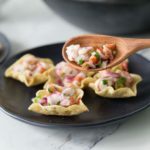 Mini beef empanadas are a meat filled pastry you can make a meal out of, or take to a party as an appetizer. A slow-cooked tomato based concentrate used to flavor rice, beans, chicken or beef stews. In a skillet, place the olive oil and heat slightly. Add the tomatoes, onion, garlic, and jalapeño. Stir fry for about 3-5 minutes on medium heat. Add the spices. Tie the sprigs of cilantro with butcher's twine and place in the mixture. Turn heat down to low, cover and let it cook for about 20-30 minutes. The mixture needs to cook down considerable, it needs to look thick. Remove the cilantro sprigs. Let it cool for about 20 minutes and place in an ice cube tray. You should be able to fill one entire tray. ** As far as usage is concerned, I normally use 1 cube per can of beans, or per cup or rice. This is right up my alley! Its going on my list to try! Hope you like it!!! I use it a lot in different things. Thanks Eliana for your comment. I will definitely look over the recipe. I think you are right! Great idea to make up a big batch and freeze! Makes for easy prep for meals. Love this recipe! Simple, clean ingredients are right up my alley! Thanks for sharing! What a delicious recipe! 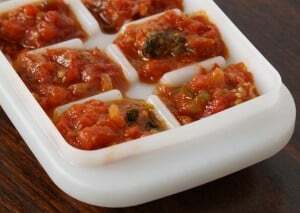 I love the idea of freezing it in ice cube trays, all ready to go to flavour-up your next dish. Genius! WOW…what a great idea. I had no idea what this was. LOVE the fact you can freeze it. I think I have all the ingredients to make this. Looks like a fun kitchen experiment for the weekend. The flavours sound fantastic. I can see myself making sofrito on a regular basis! Your recipe looks so easy and tasty and I bet would go well with just about anything! Such a fundamental recipe! Love that you can freeze it and use as you need. I love this!! Sooo good and such a easy recipe to follow. My family loved it! I love this meal prep idea! It’s amazing what you can do with a ice cube tray….I bet I could use this with cauliflower rice too! As always, love your recipe. Thanks Denise! When my ice cube trays are full I pop them out and store the cubes in freezer bags. Such a clever idea to put it in an ice-cube tray! need to do that more often. I’ve never made this myself, but I always love it when it’s served with dishes at restaurants. Now I have no excuse not to make it at home! I’m so loving this and I’m loving that you freeze these in an ice cube tray!! So authentic! I’m so making these! What a fabulous recipe with all these fresh ingredients, loving the fact that it can be freeze too!